Morgan Jesse Lappin of the BCC will be proudly be participating in the first of its kind, KOLAJ Collage FEST. Big shout out to BLENDED Magazine for doing a great feature on the Brooklyn Collage Collective and the future of collage. Click below for the full interview. 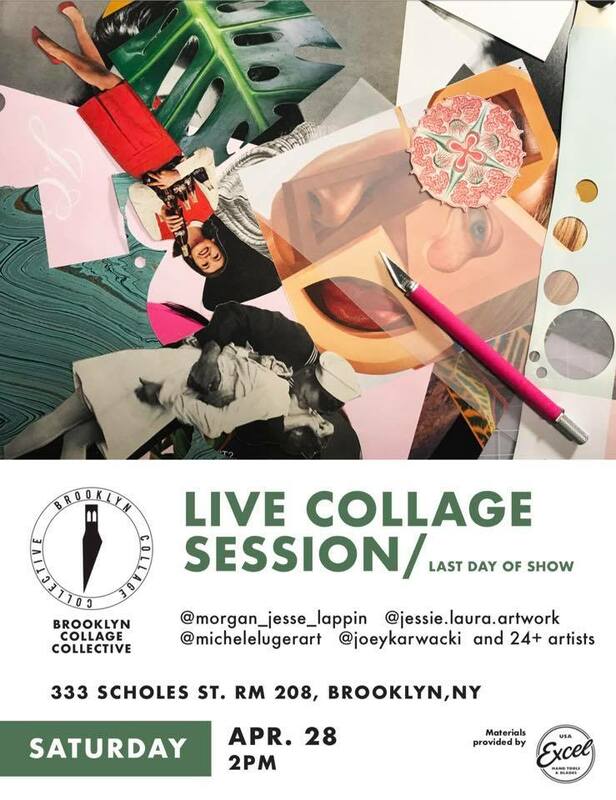 Brooklyn, New York— The Brooklyn Collage Collective was founded in 2013 by Morgan Jesse Lappin and has acted as a beacon to collage artists both local and from all over the world. Since the beginning the collective has gone through many changes, finally hitting its peak now in 2018. The core crew of 4 unique artists seek to explore and push the boundaries of what collage is, can be, and inspire those along the way. The Collective's goal is to bring attention to the medium of collage and to build a strong community of collage and mixed media artists. The Show— We are pleased to invite you to the Website/Online Shop Launch Exhibit on Thursday, April 19th at 7pm at our Pop-Up Gallery: 333 Scholes St. RM#208 and will run through April 27th. Along side of the core member’s work, we will be featuring 20+ local collage artists curated by the BCC. We will also be hosting a live collage table at the opening with supplies provided by Excel Blades. Gallery hours are Monday – Saturday 11 a.m.– 7:00 p.m. and by appointment. We respect your privacy and will have the ability to unsubscribe at your leisure.